Given how much Frankie and Mike have been dealing with the horrors of home ownership, from their malfunctioning dishwasher to their leaky room, it was nice to settle into this week’s episode, which tackled the effects of Halloween on the Heck household. I entered into the proceedings figuring that I’d be seeing a fair amount of myself in Brick’s general annoyance with Halloween costumes. As a toddler, I decried my locomotive engineer costume, shouting, “I’m not an engineer; I’m Will Harris,” and sometime after hitting double digits, I went trick-or-treating in my normal attire but carried a briefcase, claiming to be dressed as an insurance salesman… and I was not disappointed. What I didn’t expect, however, was that I’d find far more familiarity in the relationship between Mike and Sue. 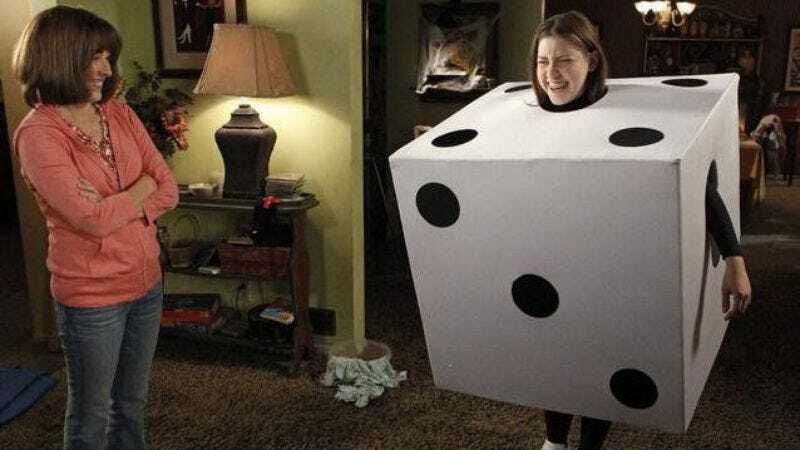 That Sue should have believed that dressing as a die was a good idea for a Halloween costume party is in no way surprising, but what was somewhat unexpected was the fact that, post-party, not only did she realize that it was a poor choice of costume, but she also began to consider the possibility that she might not be following the best of all possible paths to achieve social acceptance. As much as I love her seemingly ceaseless optimism and naiveté, sometimes she slips into a level of obliviousness that’s simply unbelievable, so it was nice to see her peek her head into the real world at least a little bit. I’m sorry, but that’s just brilliant. Sadly, it’s also completely unlike Mike’s additional conversational efforts. His effort at shooting from the hip (“Maybe you could stop dressing like a third-grader”) results in Sue digging through her closet and pulling out ensembles so hideous that you can only imagine how much fun the producers had in selecting them. Flummoxed, Mike falls back on cold, hard cash, handing Sue a 20 and suggesting that she go to the mall and ask a saleslady to help her pick out a new outfit… and damned if that doesn’t backfire on him, too. Turns out that there’s a major parental benefit to your daughter dressing like a third-grader: It doesn’t reveal how much her body has changed since third grade. Although tempted to play the bad guy and make her switch out of her cute new outfit, Mike realizes that he can’t do anything about the fact that his little girl is growing up and opts to keep his mouth shut… and it pays off, since she ends up covering up with a hideous Halloween sweater before entering the party. Yes, I know, I’m totally giving short shrift to the other storylines in the episode, so let me tackle those for a moment, too. First of all, Axl’s Halloween plans, a.k.a. Operation Sell the Suckers Back Their Suckers, were so low that I knew they’d never ultimately come to fruition, but having him and his friends turn into neighborhood superheroes was a light but fun way to have things play out. I also liked Brick’s increasing desperation over creating a costume that he didn’t even want to wear in the first place (“Look, I’m just trying to get through the night”), and I’m sure we can all empathize with Frankie’s annoyance with people who, when you say, “I’m sorry,” can’t just say, “That’s okay.” I did not, however, have a whole lot of love for the idea of Frankie having to take Brick’s social-skills group trick-or-treating. In the midst of all of these sweet and/or heartfelt storylines, it all seemed a bit too slapstick to have Frankie running through the neighborhood with all of these eccentric kids strung behind her, getting tangled up in trees and what have you. Yes, I know it was all leading up to a payoff in Frankie’s closing narration (“You know, we’re all tied together…”), but I’m still not convinced it was worth it. But, damn, the Mike / Sue storyline was 24-karat gold… so much so, in fact, that it made up for many (though not all) of the shortcomings in the others. It was in no way surprising that the one Halloween costume idea that Brick could get excited about was dressing up as a book, but the fact that he even knew what font he wanted to be? That was the kicker. I say again, I can’t imagine how much fun the producers had in putting together the parade of Sue’s possible new outfits, but the highlight had to be Eden Sher’s animal growl.